MARQUETTE, MICH. – Upper Peninsula fisheries managers are collecting data from five U.P. brook trout streams this season with the intent of adding three of those to the state’s experimental brook trout stream category in 2015. Five streams were designated as experimental in 2012 after months of public debate following a DNR proposal to double the daily creel limit to 10 trout per day all across the Upper Peninsula. The blanket recommendation proved controversial and was met by opposition from a cross-section of anglers, as well as expressed concerns from academics and U.S. Fish and Wildlife Service officials who were working to protect coaster brook trout streams. 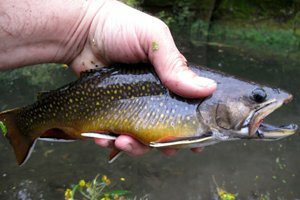 DNR fisheries biologists said then that computer modeling showed brook trout populations would not be adversely impacted by the proposed change. The experimental category was established as a compromise. It went into effect in 2013 with a promise that studies would be conducted to determine the impact of increasing the creel limit. The candidate streams are Bryan Creek in Marquette and Dickinson counties, Two Mile Creek in Dickinson County, the Upper and Lower Rock River in Alger County, and the East Branch of the Presque Isle River in Gogebic County. The five current experimental streams are the East Branch of the Huron River in Baraga and Marquette counties, the East Branch of the Ontonagon River in Houghton and Iron counties, the Driggs River in Schoolcraft County, the East Branch of the Tahquamenon River in Luce County, and the Dead River in Marquette County. Biological research began in 2013 on a number of the experimental and candidate segments. Creel surveys also were conducted on the East Branch of the Tahquamenon, and Bryan and Two Mile creeks. Anglers were surveyed about their attitudes and practices via postcard surveys left on cars at fishing access sites and using Survey Monkey, an online survey site. The results from 2013 have proved interesting, but provide only a limited snapshot. 57 percent prefer a five-fish limit; 43 percent prefer a 10-fish limit. Anglers also were asked to rank the four most important factors that determine where to fish. The “quality of the fishing” was ranked highest followed (in descending order) by knowledge of the river, closeness to home, and the brook trout bag limit. That 18 percent said they would fish more because of a 10-fish creel is something to consider, Schneeberger added. This entry was posted in Uncategorized and tagged Brook Trout, Conservation, Environment, Fishing, Nature, Rivers, Trout, Upper Peninsula. Bookmark the permalink.